Naturally, today, email as one of the most used mediums has a few tricks and rules you should follow. This article will introduce you to the types of referral emails and how to use them. Endorsements play a crucial role in today’s marketing world. The reason for this is quite simple - having an A-list celebrity or a famous influencer behind your brand makes it a lot easier for people to take notice. Whether they’re subtle or direct, endorsements convey brand value and solidify brand authority. That said, getting celebrities and influencers to back up your brand might cost you a pretty penny which is something startups and small businesses simply cannot afford due to large budgetary constraints. Fortunately, the same effect can be accomplished for a fraction of the cost of a traditional celebrity endorsement. Referral marketing is an excellent way of using current customers to promote your products and services. It’s the customers themselves who can help you increase engagement, maintain loyalty and improve conversion rates. Referral emails allow marketers to tap into the customer’s own networks of family and friends. In order to be truly effective, referral emails need to grab people’s attention and make them want to follow through instead of simply scrolling past your email. But what exactly is referral marketing? What are the benefits of using referral emails as part of your marketing strategy? Furthermore, what are the most important steps needed to design a referral email that gets people to take action and actually share it? Unlike traditional marketing practices, referral marketing relies on existing customers as a means of marketing products and services. A wide variety of industries, ranging from consumer brands to e-commerce companies and B2B service providers use word-of-mouth marketing as an effective, low-cost way to build brand awareness, generate new leads and improve sales. And with over 5 million active users, email has proven to be the go-to channel for marketers when it comes to encouraging referrals. What constitutes a great referral email? The first thing people notice when they receive an email is the subject line. It’s what helps them decide whether to open it right away or scroll right past it. As such, the subject line needs to be clear, concise, engaging and informative in order to grab the reader’s attention. Use as few words as possible to explain your offering or tell the reader what they need to do in order to enjoy the benefits. Numbers tend to stand out among the letters, which is why it’s always best to state the amount of potential savings up front. Design communicates brand value and content provides it. You can have a beautifully designed piece of content, but all that beauty is meaningless unless it offers a solution to a specific problem, links to resources or any other valuable things for your recipient. Alternatively, no matter how informative and valuable your content may be, people are hardly going to pass on a referral that looks like it was designed by a freelance amateur. Successful brands often rely on dedicated marketing experts to help them develop an effective referral email strategy. But finding just the right expert is not always as easy as it seems, especially when you’re working with small teams and a limited budget. Fortunately, there are resources that allow you to filter search marketing experts and sort them out based on available budget, team size, location, etc. All referral emails fall into two distinct categories: those sent between brands and referrers and those sent between referrers and their friends. The first type of referral emails is sent by marketers as a part of a master email list that simply asks people if they could refer their family and friends to a specific product or service. The second type of referral emails is sent by the referrers themselves in order to introduce their friends and family with a particular brand and its offering. Brand-to-referrer emails are generally used for referral program announcements and invitations. They can be sent either by using an ESP like Elastic Email or via your own referral platform. When you choose Elastic Email to send referral emails half of your work is already completed. Why? Because we provide pre-designed templates for such emails. Of course, you can add or create your own template, but choosing from the gallery will make your work easier. Referrer-to-friend emails represent the heart and soul of referral marketing. They are often published using a referral widget and the templates can either be image-based or text only. Image-based email templates will make your branding efforts more upfront due to the large real estate occupied by the image itself, but large images tend to lack that look and feel associated with personal recommendations. Text-only referral emails are far better for preserving the credibility of a personal communication and conveying the message as a real recommendation. This doesn’t mean that you shouldn’t incorporate images into your referral emails, it should just be done tastefully. While we’re on the subject of images, Postable is a service that allows users to send beautiful postcards made out of recycled paper. The company will print, stamp and mail birthday cards, thank you notes, business cards, invitations, you name it. But what’s interesting is their use of large yet simple graphic explanations. The $5 worth of credit is displayed both as text, but also as an animation of a hand holding and waving a $5 bill, with a “learn more” button placed between the text and the animation. Outdoor Voices is another company that uses simple text over a colorful image. It only takes a single glance to know exactly what the company is offering - $20 off your first purchase of their technical apparel. 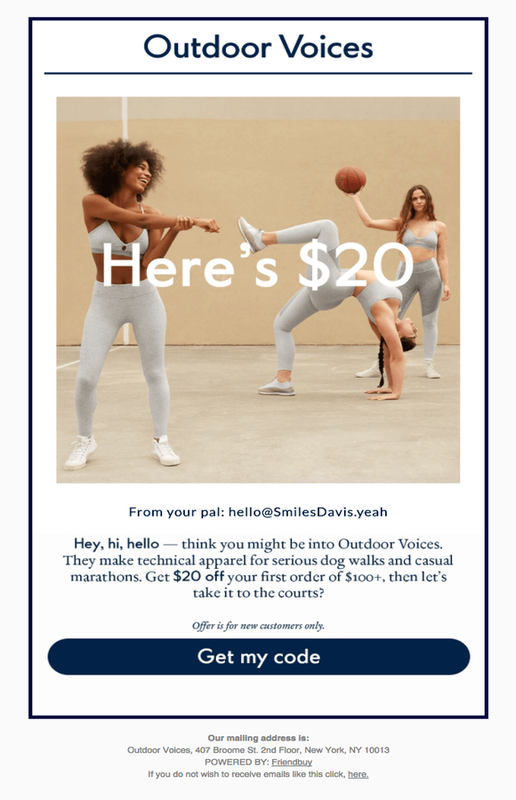 The offer itself is further emphasized using a textual explanation beneath the picture, with a blue “Get My Code” button standing as a stark contrast to the white background. 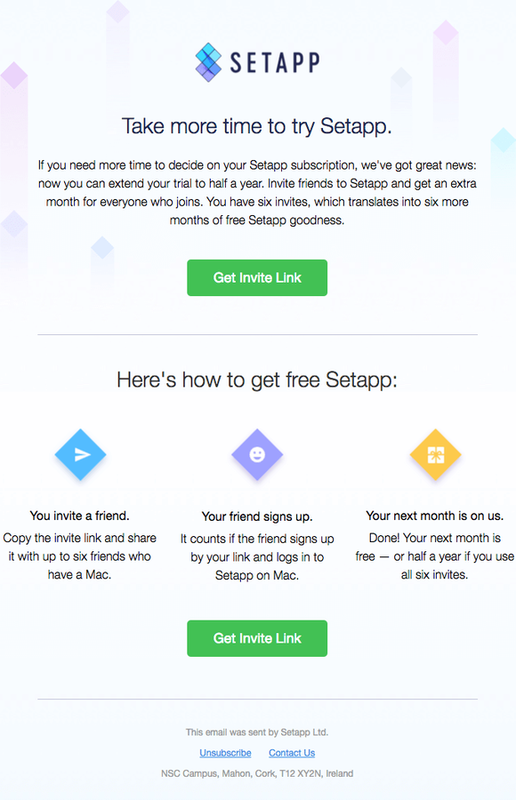 Unlike Postable and Outdoor Voices, Setapp relies mostly on text to convey their offer, with the upper half of the email inviting users to try out their service and the bottom half detailing exactly what they need to do in order to try it out for free. Both halves contain the “Get Invite Link” button, so even if you weren’t on board with the initial invitation, the subsequent explanation and the promise of a free trial period are cleverly designed to drive the message home. As you can see, both image-based and text-only emails include a bold, clear and legible CTA that makes it abundantly clear what readers need to do. One of the layouts goes even further by illustrating a simple, three-step process to highlight just how easy and straightforward it is to refer your friends. A text might be able to simulate a real recommendation, but graphics can be used to convey ideas without the risk of them getting lost in a large body of text. Either way, an effective referral email is one that gets to the point fast while still proving a small overview of the benefits of joining a referral program. 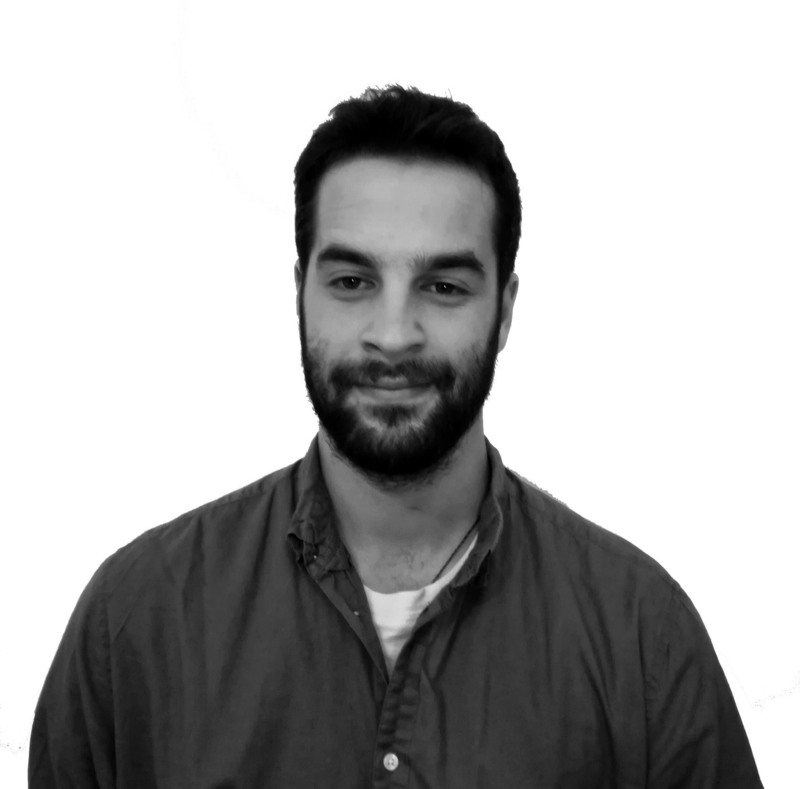 About the author: Daniel Bishop started off as a content consultant for small SEO and web design companies. Online consulting was perfect for him as he is very social and loves to travel. Settling down in Europe, for the time being, he finally found his place as a junior editor for Design Rush a B2B marketplace connecting brands with agencies. Always searching for new opportunities, he loves sharing ideas with other professionals in the digital community.